This is a dense, boozy, spicy Christmas cake that evokes many happy memories. My Mum Jenny Hobbs made this every year when we were kids, using a recipe inherited from her own mother, and I have used the same formula (with a few tweaks of my own) for the past 20 years. You'll find the recipe directly below and, underneath that, my detailed cook's notes. 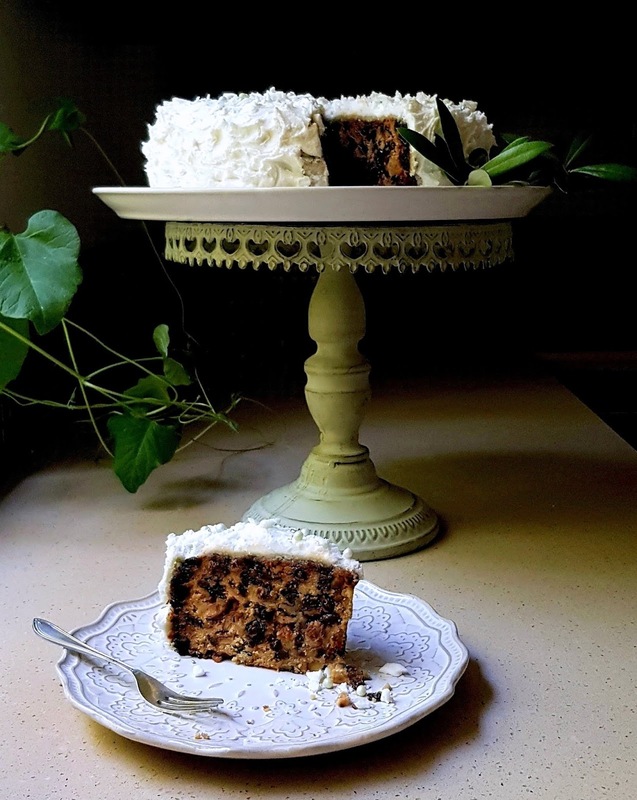 Whether you serve this cake naked, or add a cloak of home-made marzipan, or add marzipan and Royal icing is up to you - isn't it interesting how people have emphatic opinions about what should go on top of a Christmas cake? Is a luscious, almondy layer of marzipan enough? Or must every fruit cake be smothered with a swirly frosting of deliriously sweet, tooth-cracking Royal icing? You tell me! I've halved my Mum's original recipe, which is so enormous that it requires a gigantic mixing bowl and very strong arms. But still, this halved formula will make a cake that easily serves 10 people. Some of the ingredients for a double batch. Heat the oven to 150 ºC. Prepare a deep 24-cm springform tin. Place the tin's base on a doubled-up sheet of baking paper, draw around it with a pencil, and cut out the two circles. Put the base into the ring, snap it shut and press the paper circles onto the base, buttering each one generously. To line the ring, cut a long strip of baking paper double the height of the tin. Fold it in half lengthways and butter it on both sides. Press the strip, folded side up, around the inside of the ring. Now prepare the fruit and nuts. Roughly chop the apricots, pecans and walnuts, and cut the cherries in half. Put them into a big bowl along with the mixed dried fruit and almonds. Add 2 Tbsp cornflour and toss well, using your hands, so every piece is lightly coated. Set aside. To make the cake batter, cream the softened butter and sugar together in a large bowl until light and fluffy. Add the eggs one by one, beating well between each addition. When the mixture is smooth and creamy, add the sifted flour and cornflour and mix well. 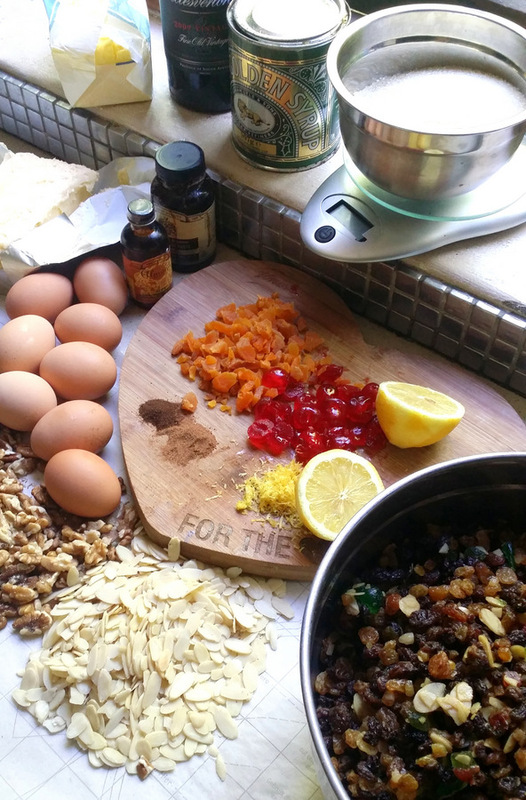 Stir in all the remaining cake ingredients and then add the fruit and nut mixture. Stir well to combine (this is a very stiff batter - please see my tips in Cook's Notes, below). Mix to a very stiff batter. Spoon the mixture into the cake tin and smooth the top. Place on the centre rack of the oven and bake for about two hours and 20 minutes. You will know the cake is done when it is deep brown on top, and feels firm all over when you press it with your fingertips. At this point, stick a wooden skewer into the cake. If the skewer comes out dry, with no wet batter sticking to it, your cake is ready. 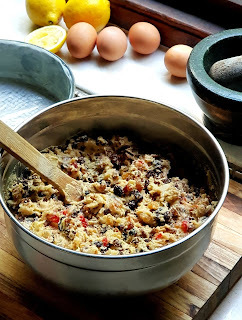 Check on your cake after about 90 minutes - if you notice that the top is browning quickly, and/or the raisins are burning, cover it loosely with a sheet of tin foil. Remove the cake from the oven, and immediately pour over 3 Tbsp of brandy - the cake will sizzle satisfyingly as you do so. Now cover the tin loosely with foil and let it stand for a day. To 'feed' your cake: leave it undisturbed in the tin, loosely covered. (It's important not to seal the top of the cake too tightly, or the alcohol will not evaporate.) Use a slim skewer to poke about 12 deep holes right to the base of the tin. Every two or three days (depending on how boozy you want your cake), trickle a little brandy over the top, and tilt the pan as you do this so the alcohol seeps evenly into the holes. To make the marzipan, blitz the whole almonds to a fairly fine powder in a food processor fitted with a metal blade (but don't overprocess them, or they will become oily). Add the almond flour, icing sugar, egg white, and a few drops of almond extract, to taste, and pulse until the mixture forms a smooth ball. If the marzipan isn't clinging together, add a few drops of water and pulse again. While the marzipan is still warm and flexible, roll it out into a thin sheet big enough to cover the whole cake (see Cook's Notes). It's best to do this between two sheets of baking paper. Warm the apricot jam and brush it all over the top and sides of the cake. Drape the marzipan over the cake, pressing down lightly and easing it down the sides. Trim the excess marzipan all the way round the base of the cake. For Royal icing, lightly whisk the egg whites until just frothy. Add the sifted icing sugar, a spoonful at a time, stirring well. When the mixture is thick, stir in the lemon juice and (optional) glycerine. (The glycerine prevents the icing from setting to rock hard). Using an electric beater, whisk the icing for ten minutes, or until it is glossy, white and standing in stiff peaks. Dollop the icing on top of the cake and use a spatula to spread it evenly across the top and sides. Using a swirling motion, create little spikes and peaks for a snow-scene effect. Set aside, uncovered, to dry for at least 12 hours, then transfer to a cake tin. Makes 1 fruit cake, enough for 10. This recipe is easily doubled, but mixing such a large quantity of batter takes powerful arms and a very big mixing bowl. 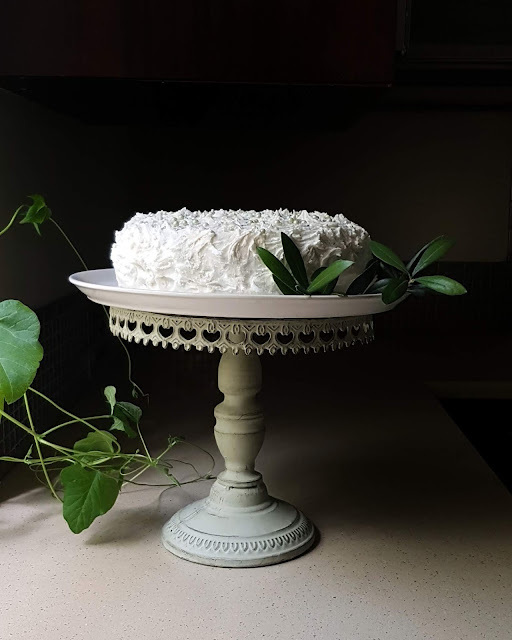 Use a cake tin about 28 cm in diameter and at least 7 cm deep, and insulate the tin by wrapping a double layer of brown paper around the outside and securing it with wet string - this will prevent the outside of the cake burning before the inside is cooked. A bigger cake will take between 2½ and 3 hours. Add the fruit and nut mixture to the batter in batches, using a wooden spoon and a stabbing motion. This is a very firm mixture, so take your time. If the batter seems impossibly thick, add a little milk. You can make this cake up to six weeks in advance, but I always start three weeks ahead. Add the marzipan and Royal icing a few days before Christmas. To figure out the size of the marzipan circle, place the end of a piece of string at the base of the cake, drape it across the top, and then take it down to the base on the opposite side - this is the diameter of your circle, but add 1 cm to be on the safe side. You can use all almond flour for the marzipan if you're in a hurry. Swirl the Royal icing to create little frosty peaks.